Purpose: Over the past year the New York Lottery has generated over 7 billion dollars in ticket sales, with over 2 billion being sent to the education system1. Large contributors to this total are sales from scratch off lottery tickets, but pressure to keep games interesting has led to a wide range of styles and rules, which might be confusing to players. Recently, Scientific Ameriken made a discovery that could be the start of a new revenue stream for scientific research. This discovery was the existence of a small waste basket found nearby a lottery ticket dispenser that was full of tickets. Hypothesis: Scientific AmeriKen hypothesizes the multitude of games, rules, conditions for winning, side games, etc will lead to player confusion and that players might mistakenly drop winning lottery tickets into the trash can. 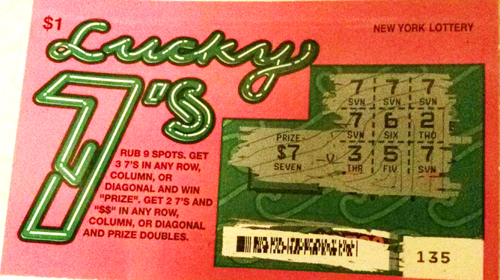 Materials and Methods: Needed for this experiment is a source of "used" lottery tickets and one lucky quarter in case additional scratching of the ticket is necessary. Additionally, the researcher must be at least 18 years of age to redeem prizes. Results: Figures 1-5 below are representative samples of actual tickets found. Of the 12 tickets recovered 7 had a "winning" status. Figure 1. 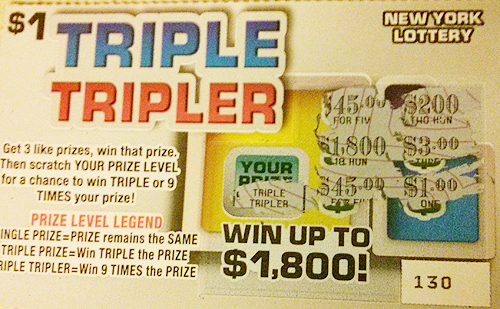 Although the surprising text of this ticket leads one to believe they are a winner after getting a "triple-tripler", it is in fact a loser ticket. Figure 2. 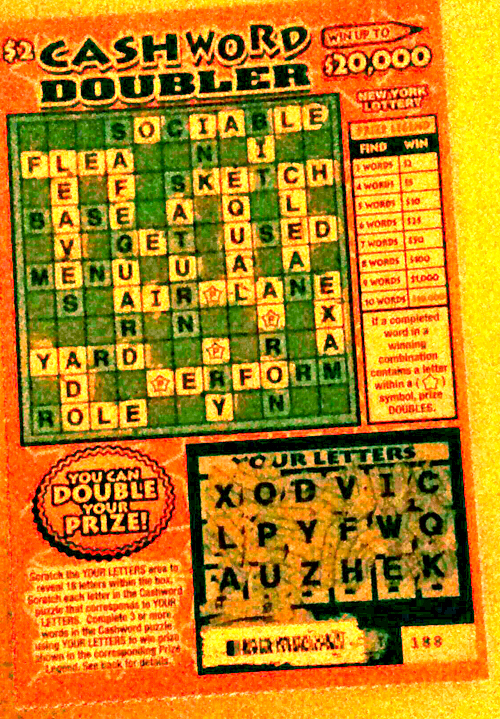 The "scrabble" style lottery ticket can be very confusing. Letters found on the bottom under "Your letters" are used to remove letters on top. A win is determined by the number of complete words uncovered. In this example the individual had to uncover the words "Flea", "Ado", and "equal" in order to realize they won their $2.00 back. Figure 3. 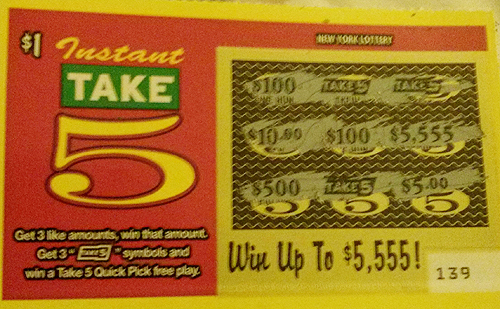 Although this ticket utilizes the classic, "uncover 3 of the same prize to win that prize", it is suspected that this individual just did not care redeem the ticket to gain a measly "Take 5" quick pick ticket. Figure 4. In this "frogger" style game the player has to scratch and follow the path and if leads to victory as in the figure on the right they win. It is unclear why the user left this $5.00 behind. 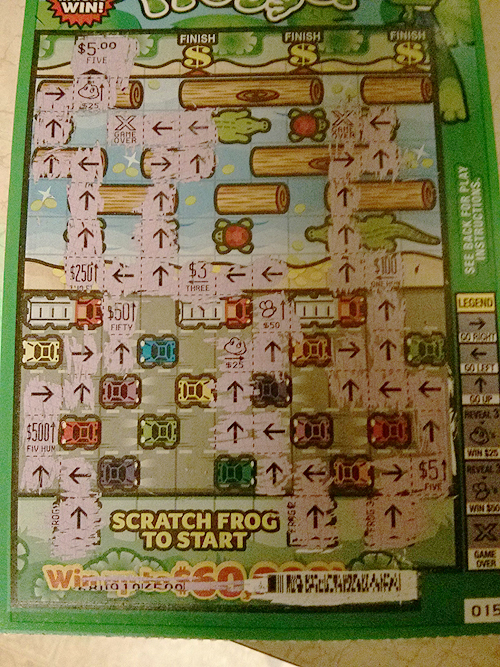 Another ticket with this game was found where the user won not by following the path, but by getting the same value across the three lanes, which not seeing this win might be more understandable. Figure 5. Scientific AmeriKen can only surmise the player was blind. Conclusions: In total Scientific AmeriKen collected discarded tickets worth roughly $50.00 in winnings. Unfortunately, this promising money making strategy was thwarted by a huge revelation while attempting to cash in said tickets. Apparently winning tickets once redeemed are returned back to the player. Scientific AmeriKen believes this is an intentional strategy by the lottery commission to discourage recovery of unclaimed prize money, which state lotteries use to enhance player pools or promotions2 or enhance school funding3. Although, the embarrassment of trying to redeem "redeemed" tickets certainly makes diving in trash cans even less appealing, it is noteworthy that Scientific AmeriKen claimed two "take 5" quick pick tickets in winnings. Even though these eventually ended up as losers, the feasibility of this strategy for financial enrichment is more or less proven. Join the discussion of this experiment at science chat forum!